Agendas are kind of our thing (we built an app just for that). 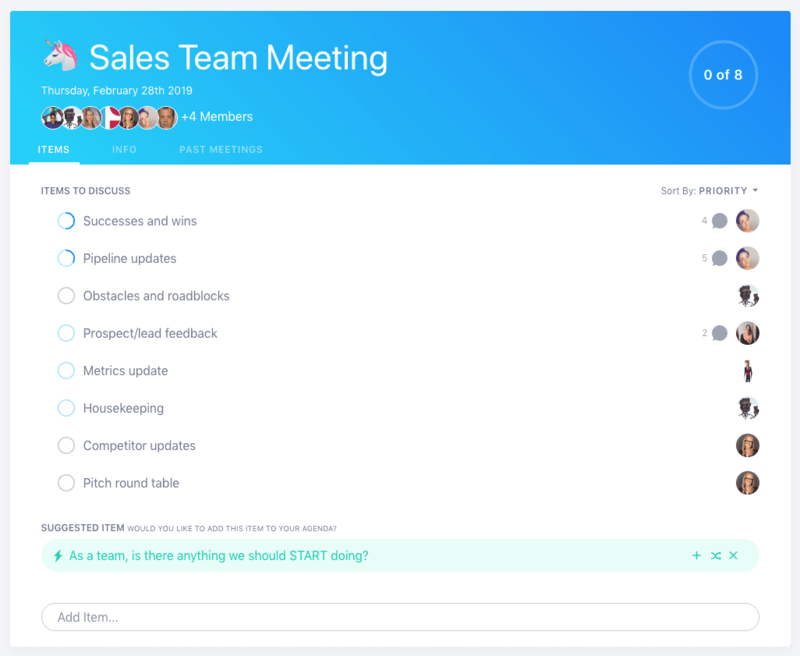 So for the next few weeks, we’re sharing agenda templates for every type of meeting, from marketing meetings to board meetings. In part one of our agenda templates series, we’re highlighting sales teams. What does a successful sales meeting agenda look like? We’ve consulted our SoapBoxers, and have a list of must-haves. Here are eight items to add to your sales meeting agenda. TLDR? Click here to sign up and use this template in SoapBox! Always start with a positive in meetings. It’s a rule we live by here at SoapBox, and it truly makes every meeting far more productive. Have your sales team share a recent triumph to kick off the discussion. Think along the lines of closing a big deal, big insights, percentage towards target or similar. Go around your table and get a pulse check on where each sales team member’s pipe sits. This will give you an opportunity to identify individually and collectively as a team where you need to jump in and support. It will also give you the information you need to prioritize your – and your team’s – activities for the week (i.e. where physically you need to be for meetings, what prospects need following up and where to prioritize your time). Starting with pipeline updates is a natural segue into where there might be roadblocks or hurdles. Is your team being held up by you or other departments? What in the coming week might get in the way of hitting your targets? Think beyond just internal business hurdles to other obstacles, like people out of the office that week, travel plans or holidays. Your sales team are the front line when it comes to receiving feedback on the business. Make hearing this feedback a priority in every sales team meeting agenda. Ask what feedback your team is hearing on the company, their pitches, the business and more. Make sure you document this! Whether or not it’s your responsibility, make sure metrics are covered in every meeting and that they’re tied directly to the team’s core goals. Forget vanity metrics that don’t actually reflect performance objectives. How is your team is tracking towards weekly, monthly or quarterly monthly targets? Avoid calling out individual performance here (save addressing that for your one-on-one meetings) but give the team an idea of where numbers are at, and where they need to be. As a manager and leader, you’ll have insight into parts of the business that your team might not. Housekeeping is the opportunity for you to distribute this information. Transparency is key! Keep your team abreast of things like business strategy, product updates, marketing campaigns or anything else that comes up. For sales teams, keeping an eye on the pulse of the competition is a huge opportunity to grow, learn and carve your place in a market. Have your team come to each meeting with something they’ve learned or spotted competitors doing. If you have the time, do a deep dive into one of your competitors every team meeting, taking a look at their business strategy, USPs and pricing. Reserve 10 minutes of your meeting for either one person to present their 10-minute sales pitch, or for the entire team to each share their 60-second pitch. Then, go around the room and collect feedback and ideas. Are there inconsistencies in pitches? Could some of the closing pitch phrases be more actionable? Here’s your opportunity to refine, lead and refine again. Every sales meeting agenda will be different depending on size, structure and industry, but we’ve found that sales meetings that address the questions above result in uber-productive meetings. And who doesn’t want that?